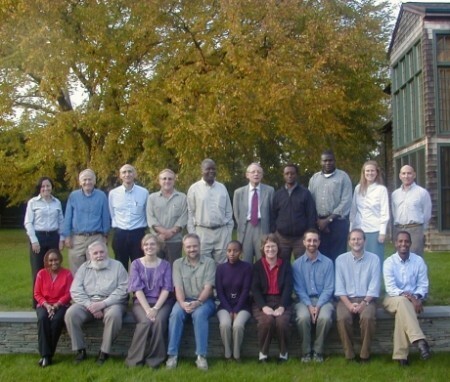 Twenty-two scientists gathered for the Sixth Stony Brook Human Evolution Workshop, From Fishers to Herders: Holocene Subsistence Intensification in the Turkana Basin, in East Hampton, New York, October 15-19, 2008. The workshop examined several changes in human lifeways around Lake Turkana during the past 20,000 years. The Turkana Basin may have been a refuge during an extremely arid period 20,000-10,000 years ago. When the climate became moist c. 9000 years ago, Turkana became a mega-lake; nearby people exploited lush grasslands, and used bone harpoons to fish and hunt aquatic animals. Abundant resources allowed them to have nearly sedentary lives. As the environmental conditions became drier over the next 5000 years, livelihoods changed, and herding was eventually adopted in the area by c. 4000 years ago. Soon after, people around Turkana began building special-use sites with stone pillars and circular platforms. These may have had ceremonial or archaeo-astronomical functions. This general sequence of change has been known since the pioneering archaeological research in Turkana during the 1960s and 1970s. However, the exact causes of these changes in diet, economy, and social structure are still not well understood. Currently, we do not have enough data to say whether they were directly linked to changes in environment, and whether they occurred due to local inventions or technology adopted from neighboring regions. exploring evidence for elaborate social networks among prehistoric people around the lake. A major workshop objective was to bring together senior scholars who pioneered Turkana archaeology during the 1960s and 1970s with younger researchers bringing new methods and theoretical approaches to the area. Scientists working in adjacent regions offered perspectives on the relations between human behavioral changes in Turkana and other parts of Africa. In addition to 3.5 days of intensive discussion, the workshop featured excursions to East Hampton’s Walking Dunes, and tours of local historic sites. A wine tasting, led by Louisa Hargrave, featured several noteworthy Long Island vintages crafted by PaumanokVineyards. The workshop was funded by the Wenner-Gren Foundation for Anthropological Research and the Turkana Basin Institute. East Hampton philanthropist Michael Braverman made his home available for daytime scientific discussions; he and several other local donors (John de Cuevas, Lys Marigold, Edwina Von Gal, the Hayground School, the Peconic Land Trust and the Watermill Center) housed the visiting scholars and hosted evening events for the scientists and members of the East Hampton community.